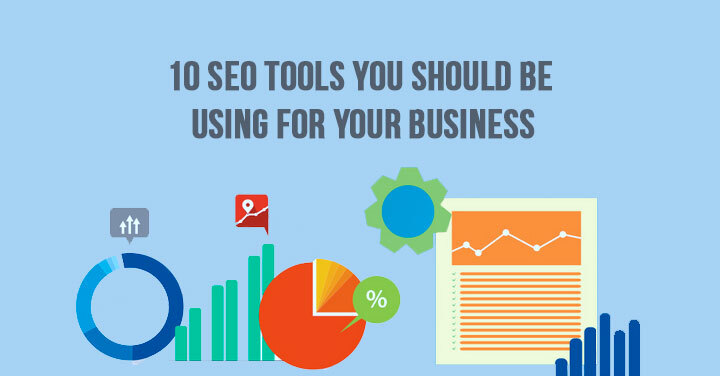 Here at TechWyse, we regularly interview SEO and digital marketing experts who have made their mark in the field. Over the past few months, we have blogged some really insightful pieces by interviewing the likes of Rand Fishkin of Moz, Stewart Rogers of VentureBeat, Mark Traphagen of Stone Temple Consulting, and Barry Schwartz from RustyBrick. Getting an industry expert’s email address can be a huge hurdle if you do not know someone in their circle. Rob Ousbey of Distilled did a very detailed piece on how to find email addresses using the Rapportive plugin, and Rapportive has been my go-to app in the past for such situations. However, after LinkedIn acquired the Cambridge-UK based startup, they removed a feature that displays the social media accounts of a Gmail contact (when you type the email in address bar), and the ‘raplets’ and ‘notes’ feature that enabled users to add social media data and notes. Now, all Rapportive can do is show their job title, company and LinkedIn profile, and any social profiles that are associated with their LinkedIn profile. So, I set out on a task to learn how to find almost anyone’s email address. The results were astonishing. I uncovered not one, but several tactics to dig out emails and decided to jot all of them down in a blog post, so here we are! But before I begin…with great power comes great responsibility. I have never come across a situation where I was unable to find an email address using all these tactics. 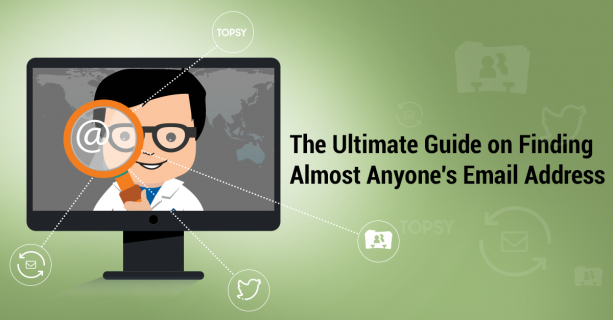 Use these tactics wisely for legitimate outreach purposes. FullContact is rated as one of the best alternatives to Rapportive. I’ve tested out a number of plugins for this purpose including Sidekick, Discoverly, Vibe, and Connect6 over the past few months. FullContact continues to be my personal favorite. The strategy I use here was originally developed by Rob Ousbey of Distilled. Kudos to you, Rob! In my opinion, this method yields the most accurate results if you’re searching for someone’s email address. Now, install the FullContact plugin from the Google app store. Now, we all know Rand works at Moz, so obviously his email address should be something like randfishkin (at) moz dot com . Now, say hello to the email permutator (courtesy again to Rob). The email permutator is an excel sheet that will help you make a list of all possible combinations of Rand, Fishkin, and Moz.com. One of these will be (with a 75% probability) the email address of Rand. Here is the link to the email permutator spreadsheet. It’s in read-only format, so make a copy to use it. (You may also use this email address guesser instead). 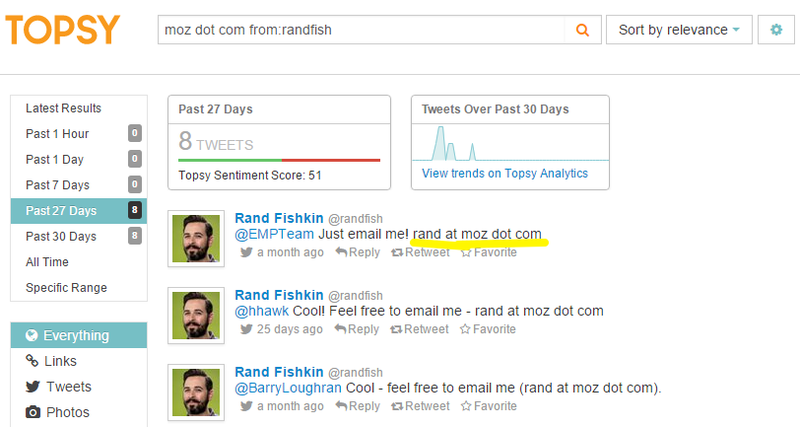 So we enter Rand as the first name, Fishkin as the second name, and moz.com as the domain name. Now, the spreadsheet produces a whole bunch of email addresses permutations. Copy this list, login into Gmail, and select any random conversation and click ‘Reply’. Go ahead and paste the email list into the ‘to’ box. 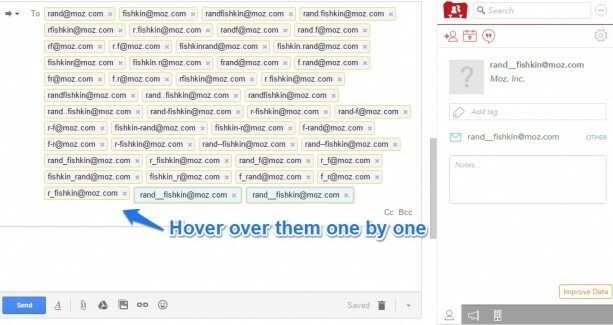 Hover over the email addresses one by one with your mouse and FullContact pops up from the side and shows you all the social profiles associated with that email address. Finally, we land upon the email address rand at moz dot com for which a number of social profiles- LinkedIn, Twitter, Klout, Pinterest, and several others show up. This confirms that this is the correct email address of Rand! One thing to note here is that LinkedIn shows up a LinkedIn profile if the email is associated to any LinkedIn profile. It may not be the real email address of that person. So, hover over each of the email addresses and find one that has more than one social profile showing up. There are several other plugins like Rapporto, Vibe, and Discoverly that are similar to FullContact and are great for finding email addresses using this method. However, I prefer FullContact due to its speed and user-friendliness. It’s not uncommon for people to share their contact details on Twitter. There are several tools out there to search through tweets like All My Tweets and Topsy. All My Tweets allows you to view all the tweets by a person in one single page but importing thousands of tweets from a user’s Twitter account on one single page can take time. So, I use Topsy instead. First, I go to the advanced search feature. 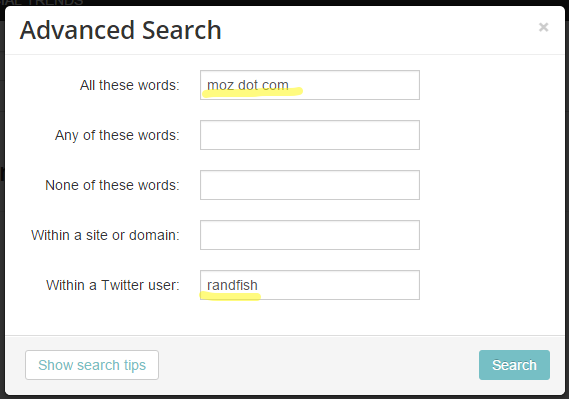 Then, I use the keywords that relate to Rand, such as Moz, dot, and com. Voila! We just found Rand’s email (yet again!). This is more of an already existing Google+ feature. However, not many people know this. Google+ offers the ability to mail people in your circles once. First, select the person you wish to email. Find their Google+ account and add them to your circles. Next, simply log in to your Gmail account and type their name in the address bar. Their Google + profile pops up. However, you will not be able to see the email address. If the person replies to the mail, you will see their email address and can continue the conversation. If they don’t reply, you won’t be able to mail them again. Ouch! Do note that this feature can be disabled by users in their Gmail settings. This is a trial and error method. Use Rob’s Email permutator spreadsheet and generate a list of all the possible email addresses of your target. Test each of the email addresses in the Mail Tester tool. You will be able to zero in on 2 or 3 email addresses that are valid. Mail all the addresses through bcc! The great thing about Mail Tester is that it first checks if there are email addresses associated with the domain. Then, it checks if the email address searches are valid. This is great because it confirms whether the email address of your target is on the entered domain itself. Another tip that I can add is using the Email format finder tool. This is a free service that finds the email formats used generally in companies. And if all else fails, I use the Email Hunter plugin. Email hunter is a cool extension that finds ALL the email addresses associated with a particular domain or LinkedIn profile! You might not be able to find your actual target’s email address, but it’s great to have this tool in your email-hunting arsenal. I really feel guilty while using this tool on LinkedIn profiles. You wouldn’t believe me if I told you how easy it is to find email addresses of world-renowned digital marketing experts at the push of a button. Luckily, it has a usage limit. A sign up will give you 200 free usages a month. Also, it’s best to test the email addresses that Email Hunter guesses with the Mail Tester tool as it tends to be inaccurate at times. Findthat.email is another plugin that is very much similar to Email Hunter. Update: I found that Findthat.email is much more accurate than Hunter. They’re a bit pricey though. If you still are unable to find the email address of your target, then a Google search using a site operator is the only option left. 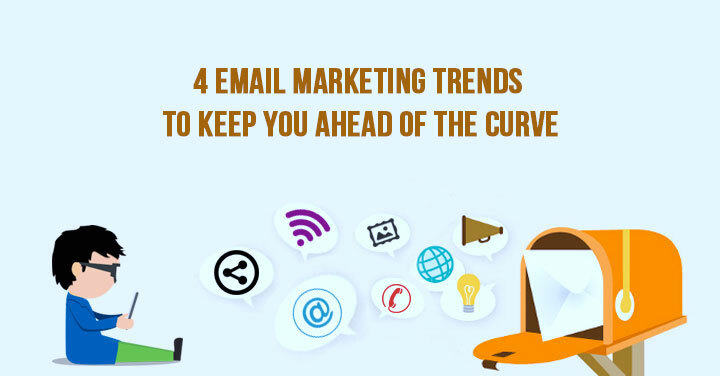 To avoid spam and to escape from email finding tools like Buzzstream, many people display email addresses as, for example, adithya at TechWyse dot com. Data.com Connect (previously Jigsaw.com) is a directory of business contacts, where other community members contribute contact information to earn points, which can then be spent for getting access to contacts that others contribute. Anymail Finder and VoilaNorbert are two other paid tools that automate the trial and error method that I mentioned earlier. Both offer free trials. The above tactics will enable you to reach out to anyone in the Internet marketing sphere. There are no guarantees, though. It has worked well for me, so I believe it should work well for you too. Again, with great power comes great responsibility. Make sure you use these tactics wisely and cautiously. Networking is essential and works great, but no one likes spamming. Got any other nifty tactics that you use to find email addresses? Share it in the comments below. Quite a lot of times i struggle to find contact information especially emails for VP’s and CEO’s of respective companies. This will surely safe me alot of time and hassle. I shall surely give fullcontact a try.